Skyscrapers sit on the shore like spaceships. Multi-colored search beams light up the weeknights. Expatriates, comprising more than one quarter of the population, come to Singapore to make a dime on behalf of their domesticated company owners out West. At the docks near Clark Quay, foreigners smile at swept cement and modern buildings. Visitors from every end of Europe sip imported wine beside a river that overlooks a Las-Vegas-style dining and entertainment complex — complete with sushi and Chinese Opera — and they watch, fountain-mist baying at their skin, as riverboats glide toward the coast and sea. 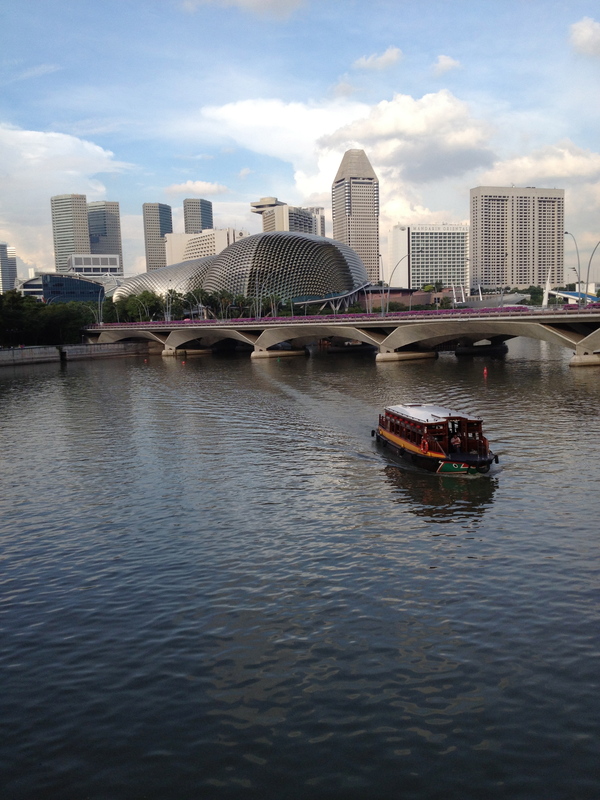 For modern city-goers without a culture, Singapore is Paradise. Singapore for locals is a corporate breeding-ground: a country that once traded its history for economic productivity and never looked back. While a significant number of local Singaporeans take part in large business enterprises, more of them — most of them of Chinese or Malay descent — serve as common employees. They are the ones offering company pro-mos on the streets and wiping down unoccupied tables at the cafes. They manage restaurants and parole the malls. In the underground railways (which are disconcertingly idiot-proof), middle-aged government workers polish single square-yards of floor tiles for five or more minutes, waiting for hundreds of foreign feet to soil it all. The Singaporean skyline. Upon first looking at it, you might think the architecture looks surreal. 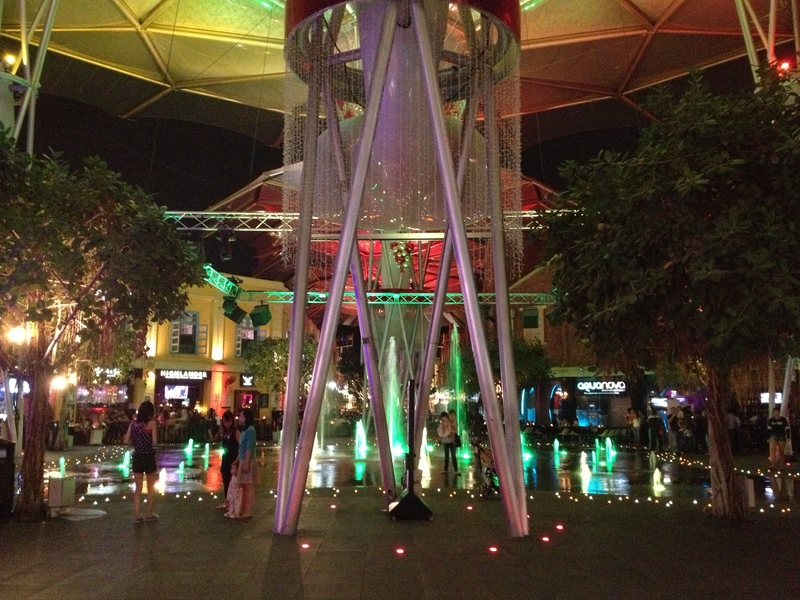 Clark Quay at night, near the river in the picture above. Here people enjoy fine dining and watch rainbow fountains. I heard there was also a hologram fountain, but I was not lucky enough to witness it. In Little India, the streets are neither mopped nor swept: a relief, for some. Food stores are everywhere and stock standard Indian imports. The shop-owners are nearly all men. Dark-skinned. Hastily-shaven. Women gather produce. After nine-o’clock at night, the women disappear and men begin roaming the streets alone. Many of them have alcohol guts that weigh over their belts, and all stroll in an easy manner hinting at many nights of ambling the same route with nowhere to go. My one night in Little India, I sat outside a youth hostel drinking red wine out of the bottle and watching passerby. I had just finished arguing with three young Norwegian backpackers who insisted that there was something “fundamentally wrong” with the American system of government. The arrogant, blue-eyed gentlemen sat with beers propped on their long legs as they spoke of luxurious travels from Thailand to Brazil. Across from the youth hostel was a gentlemen’s club. Chinese women in short skirts and high heels sat outside the venue and chatted with men at sidewalk tables. Behind them, solitary night-goers of all nationalities exited from an opaque door that closed into a painted seascape. 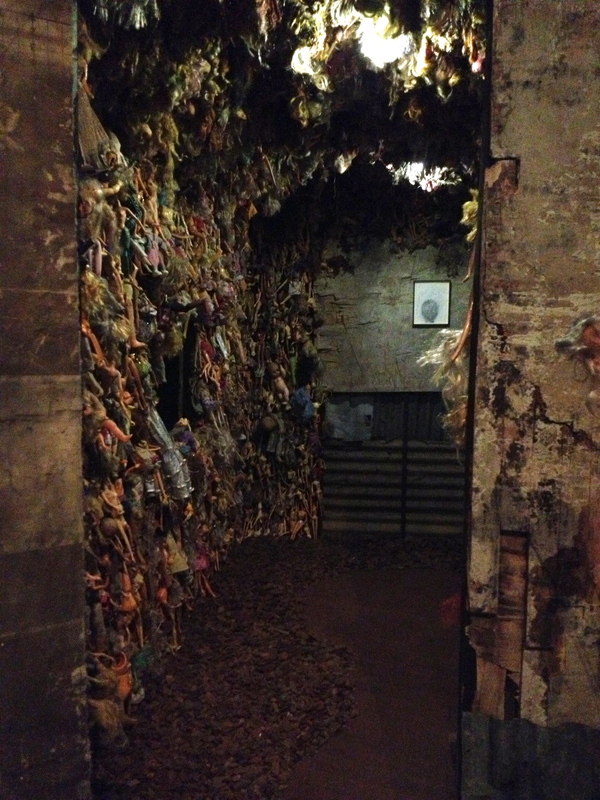 To the left and right of the club where merchandise shops. Each had a large shelf for liquor in back, clearly visible from the street. Liquor is extremely hard to find in Muslim-dominated Java, and — if purchased — must be delivered in brown packaging at tolerant venues. The more I drank my wine, the more the whiskey shelves of Little India stood out to me like exposed breasts. In Chinatown, near the railway station, a complex of shops sold low-caliber clothing and Chinese dumplings. I was directed there by a lonely Sri-Lankan in Fort Canning’s park who, despite being a local, asked me for directions to the Botanic Gardens and then – five minutes after introducing himself – attempted to develop a conversation about the beauties of inter-cultural marriage. 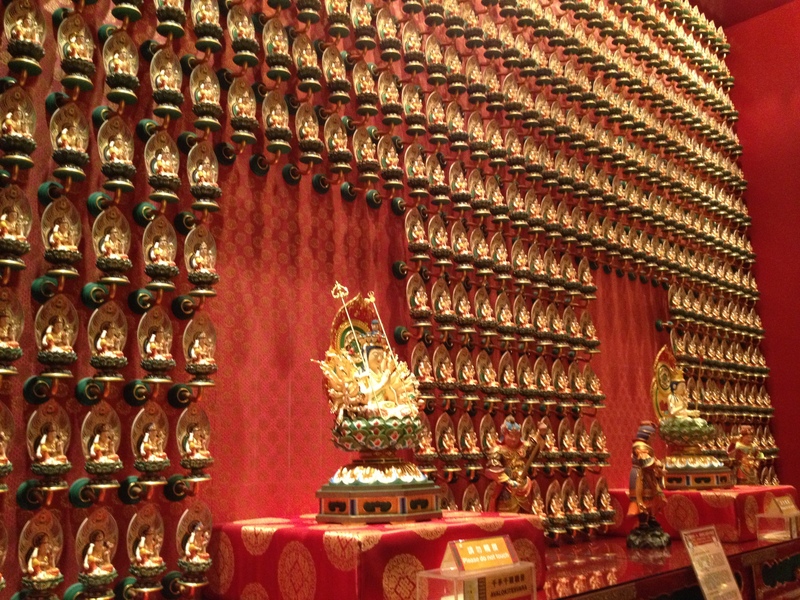 Upon entering Buddha Tooth Temple in Chinatown, I was surprised to find a blend of Hindu and Buddhist idolatry. 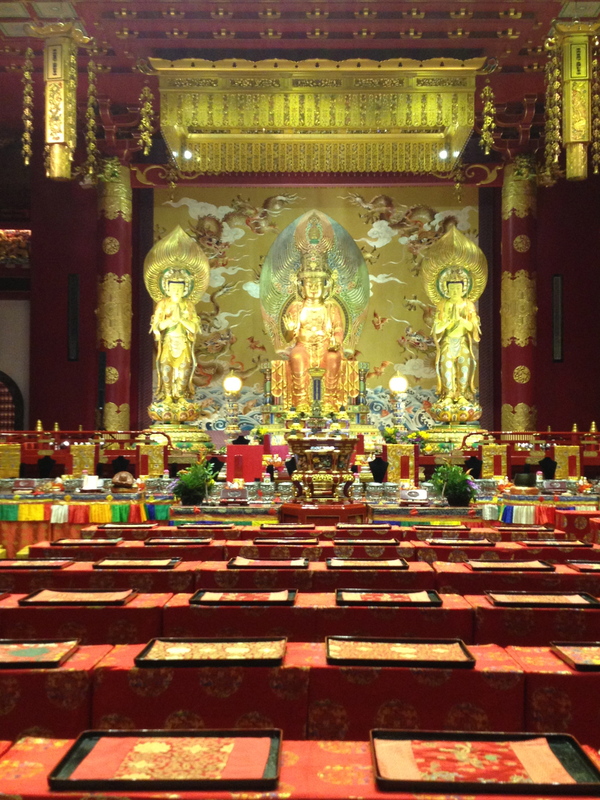 The temple was new, and was clearly as much a tourist destination as it was a worship space. 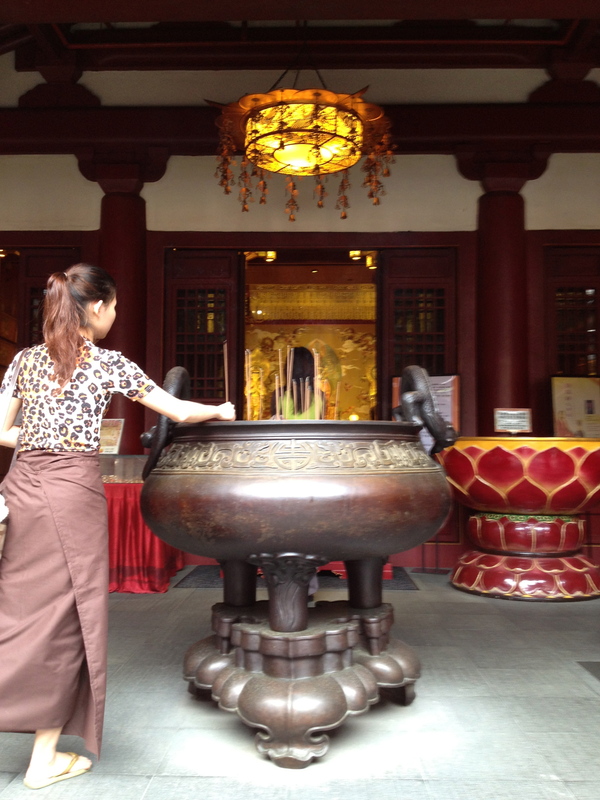 In the temple museum on the third floor, there was a stool for visitors intending to pray on their knees. The stool was surrounded by transparent vials sectioned off by a wall of glass. The vials were displayed as if they were ancient Egyptian sarcophagi holding mummified remains, but instead contained small crystals: blue, pink, yellow. 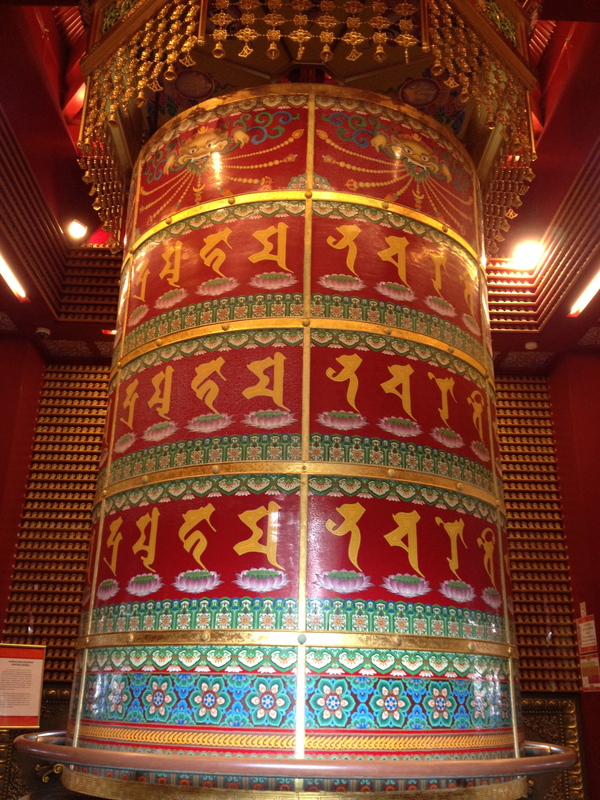 They represented parcels of Buddha’s body, among them being his brain, his heart, and his lungs. The holy man could have been strung into a rainbow bracelet. The Dharma Wheel. Worshippers take hold of a rail and walk around the wheel until it spins without human effort. Then they stand back and watch the words of the dharma pass around again and again. The repetition is meant to facilitate efficient meditation. Just around the corner was a Hindu temple and a mosque. I entered the mosque, which served free pamphlets about Islam’s promotion of peace. Upon entering the building, a Chinese man pointed out that my calves were exposed and told me to put on a robe. My short-wearing male friend was left alone. The Singaporean government takes significant pains to support its display of art, which, for the most part, is dry. 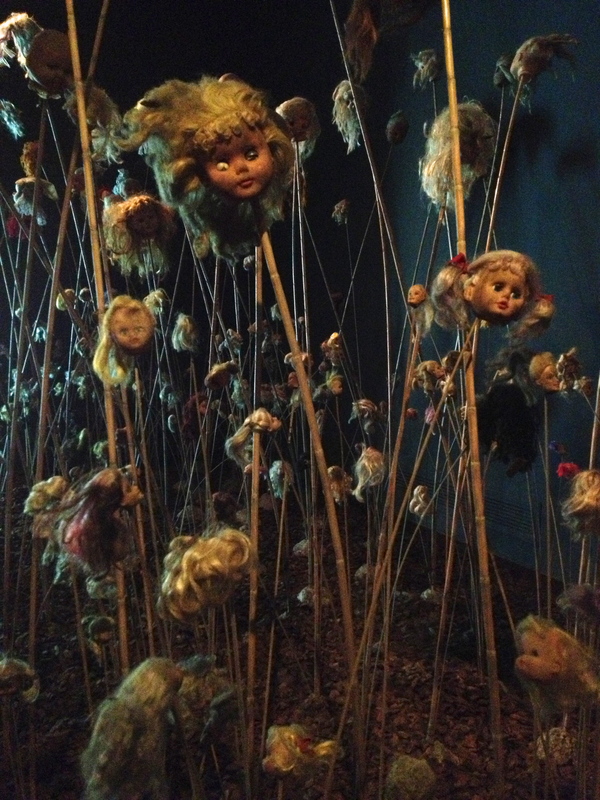 Museums are gorgeous. The Singaporean Art Museum showcases art from residents who immigrated from all parts of South Asia. Among the masterpieces are collections of coin-sized people chiseled out of wood (placed in a single galaxy formation to represent the Indonesian perception of the cosmos), a painted series of fairy-like women interweaving by the Laotian sea, a dimly-lit room containing a grass-field of doll heads capping stalks of wood like dandelion weeds to represent the “decapitated” pride among Malaysians toward their own brown skin. My host in Singapore was another Oberlin Alumni: a film professor at Singapore’s university. 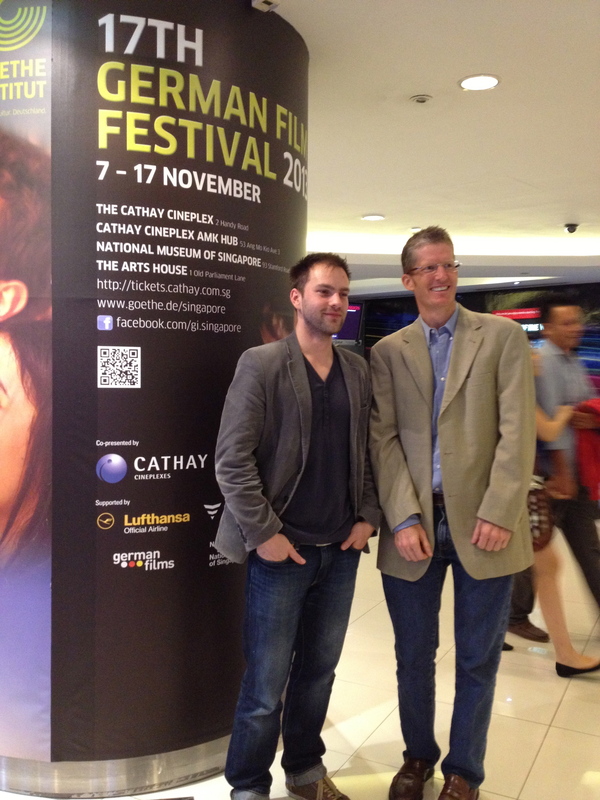 He kindly invited me to a German Film Festival at the historical Cinema, The Cathay. High-class art critics of the city joined together to drink wine and eat wedding food. Not one local Singaporean was present. Tall white Germans rushed at the trays of wine, and for the first time since leaving in Indonesia I felt my physical smallness, made more apparent by the fact that I was also the youngest of all the visitors present. The air conditioning had been hiked for those who couldn’t stand the local heat. Later, I found myself freezing in a movie theatre, watching a well-executed film about a delusional German King and wondering if the other attendees felt at all uncomfortable about the fact that the featured film had nothing whatsoever to do with the continent where we ate and slept. 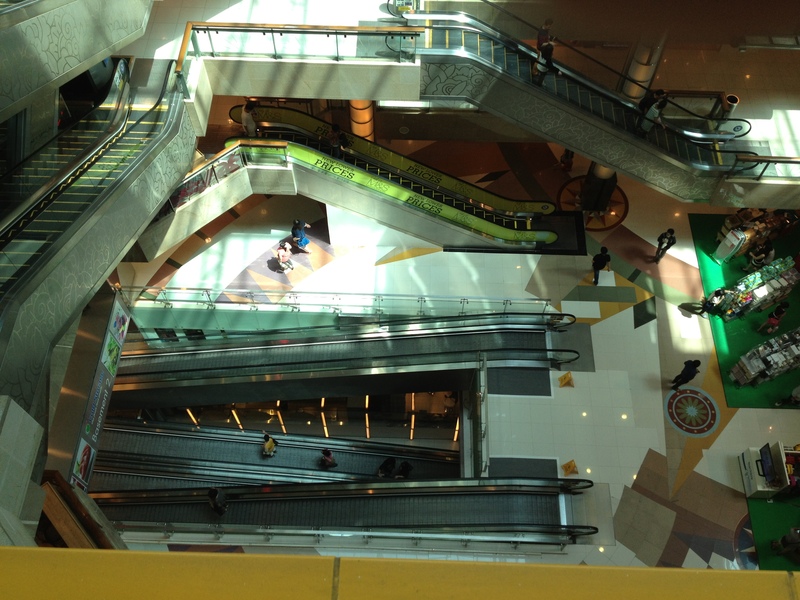 Singapore, despite being clean, easy, and bursting with corporate promise, is a cultural limbo. After four days of eating delicious food and marveling at sanitized museums, I felt ready to leave and return to Indonesia, where everything is hard and raw, yet still has a challenging depth much worth unveiling. Harry Burger sat across from me, grinning with a sandaled foot crossed over a skinny leg dressed in pleather. This would be one of the most pure-hearted people I would ever meet. On either side of Harry Burger and I were six male college students gathered in this café and soccer bar just to practice their English conversation skills. This late in the night, I was one of the few women left in the gymnasium-sized venue, and certainly the only female accompanied exclusively by men. As I sat exhaustedly on the cafe bench, I reminded myself that I had been invited here to communicate about my culture to anyone who was curious, and since I had taken residency in Indonesia to teach and be grateful, I felt I had no business saying “no” to an innocent night of coffee and grammar. Harry Burger was the first to lean across the table. “I love American English,” he said, although it was clear he spoke little of it. The men sitting around him were quiet, but Harry lunged at every silence to share the few phrases he knew in my language. He began reciting a rhyme he learned from a former American acquaintance: “Five little monkeys sitting on the bed. One jumped off and broke his head!” Then, like a cowboy from an old Western, he stood up from his chair and reached forward to shake my hand. Somewhat startled, I took it. Harry’s phone began to ring, and its tune was unmistakable: it was “Jingle Bells”. As I began to explain how his ring-tone referenced a specific Christian holiday, Harry burst out with song-like exclamation. “Congratulations! Merry Christmas!” he said, then sat down in the October night like a champ who had won a battle of wits. I laughed, but hardly knew how else to respond. The young man sitting next to me explained that Harry Burger was older than he looked (perhaps in his thirties) and had come to this city on a whim. In Indonesian, I asked Harry where he came from. “I’m from Sunda, West Java,” he said. “I came to Yogyakarta because I wanted the experience of living in a city.” It was clear Harry had no wife or family, and so had no qualms moving to a new metropolis without a plan, even if it meant relying on a low-wage job that required minimal creative-power. “I found a job at a burger stand,” he said. 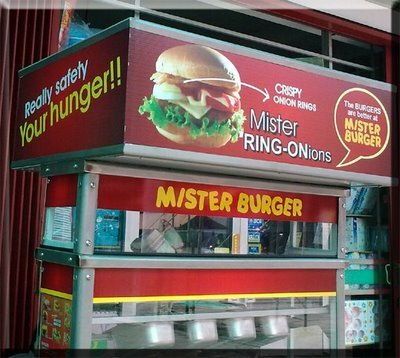 “It’s called Mr. Burger. That is why I am now called Harry Burger.” And that was that. In my life I had never met a person with a less appetizing name, nor with a more buoyant smile. The night wore on. Harry asked me if “I have to pee” had the same meaning as “I have to wash my hands”. He pronounced “p” like “f”, then ran off to the toilet to “fee”. He asked me the different variations of the word “mother”. Then he told me of the female giant of Java, and how — like in America — there was a place in Java for women who were strong. He delivered a 10 minute recitation of an Islamic prayer in English (all memorized) about how God designed men and women differently, yet did not hope to limit one gender or the other. Oh Allah, the most merciful. Harry Burger’s greatest dream was to generate the largest family possible. He made friends from all over the world, including Europe, Brazil, and Kansas, and kept in touch with every new “sibling” via Facebook. He cared about all humans because regardless of religion or geographical origins, people were all the same. An exotic cross-dresser sang and danced beside our table. Harry gave the dancer a tip and shook the dancer’s hand in greeting. I was driven home on a motorbike by a wild man with static hair who suggested that some time we go swimming together in a hotel pool. But all I could think of was Harry Burger flipping meat at a mediocre burger stand, grinning because he had a colossal network of friends founded in a limitless capacity for unconditional love. Furthermore Harry had no one to hate, and infinite confidence that his international “family” — be it in spirit, person, or Facebook — would keep him company until the day he died.